ReedGeek’s newest one piece KlangbogenTM is a beautifully crafted resonance bow and is the latest reed and overtone stabilizer designed specifically to fit saxophones that do not have the traditional lyre attachments on the horn, such as Yamaha. 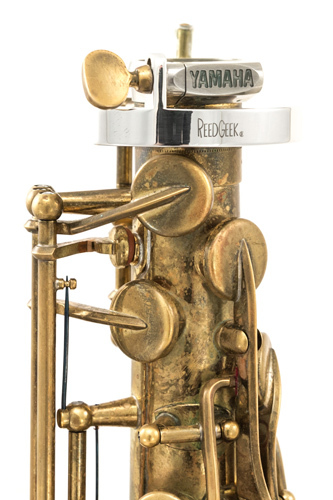 It can be used on nearly ALL saxophones by attaching to the current neck screw and positioned accordingly. This is applicable for most Alto, Tenor and Baritone saxophones and can be affixed to Soprano saxophones with detachable neck. To install, unscrew neck screw and insert into the KlangbogenTM slot, re-tightening the neck screw securely. While designed to suspend away from the neck tenon, it can also be positioned touching the saxophone body/tenon. Each position will yield a different response and resonance. Adding weight like this at certain key nodal points of the instrument is a great way to positively alter the resonance and response of your Saxophone. Give it a try - you'll be surprised how much you can feel the difference! "It shouldn't make a difference...". I wanted this to fall into the category of "Emperor's New Clothes". It doesn't! Enhanced clarity of tone and breadth in the low end. Amazing!